Cost Accounting 15 Edition ALERT: Before you purchase, check with your instructor or review your course syllabus to ensure that you select the correct ISBN. Several versions of Pearson's MyLab & Mastering products exist for each title, including customized versions for individual schools, and registrations are not transferable. In addition, you may need a CourseID, provided by your instructor, to register for and use Pearson's MyLab & Mastering products. Packages Access codes for Pearson's MyLab & Mastering products may not be included when purchasing or renting from companies other than Pearson; check with the seller before completing your purchase. Used or rental books If you rent or purchase a used book with an access code, the access code may have been redeemed previously and you may have to purchase a new access code. Access codes Access codes that are purchased from sellers other than Pearson carry a higher risk of being either the wrong ISBN or a previously redeemed code. Check with the seller prior to purchase. For undergraduate and MBA Cost or Management Accounting courses The text that defined the cost accounting market. 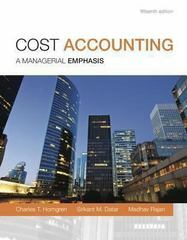 Horngren’s Cost Accounting, defined the cost accounting market and continues to innovate today by consistently integrating the most current practice and theory into the text. This acclaimed, market-leading text emphasizes the basic theme of “different costs for different purposes,” and reaches beyond cost accounting procedures to consider concepts, analyses, and management. This edition incorporates the latest research and most up-to-date thinking into all relevant chapters and more MyAccountingLab® coverage! MyAccountingLab is web-based tutorial and assessment software for accounting that not only gives you more "I Get It" moments, but gives instructors the flexibility to make technology an integral part of their course, or a supplementary resource for students. Teaching and Learning Experience This program presents a better teaching and learning experience. Cost Accounting, Fifteenth Edition will: Personalize learning with MyAccountingLab: MyAccountingLab provides instructors with a rich and flexible set of course materials, along with course-management tools that make it easy to deliver all or a portion of your course online. Get the most current information to prepare you for your field: Up-date material gives you a better understanding of the current issues effecting the business environment. Receive a solid presentation of accounting hallmarks with a great emphasis on strategy: Learn key concepts with a focus on strategy that integrates modern topics with traditional coverage and teaches you how to handle the rapid pace of change in today’s organizations. Benefit from material that has been designed to suit your needs: This text’s modular, flexible organization can be used to suit a number of different approaches to teaching and learning Note: You are purchasing a standalone product; MyAccountingLab does not come packaged with this content. If you would like to purchase both the physical text and MyAccountingLab search for ISBN-10: 0133803813/ISBN-13: 9780133803815. That package includes ISBN-10: 0133428702/ISBN-13: 9780133428704 and ISBN-10: 013345147X/ISBN-13: 9780133451474. MyAccountingLab is not a self-paced technology and should only be purchased when required by an instructor.